Call it hubris; to me it’s reorganization. After posting to no fewer than six different blogsites since 2004, I’m settling in here. Isey seems to be doing the same. In the interests of maintaining a proper archival home for our ramblings, here’s a post that appeared in the original Justifications for Idleness in May of 2008. Appropriately, I’m trying to find a home. I’m lost. I know it’s an increasingly popular sentiment in modern culture to feel at once distant and connected; the dichotomy of shrinking-planet interconnectivity and impersonal digital relationships has fractionated many an able psyche, mine included. Black Francis has been looking for twenty years now. What chance do I have? I’ve been GPS-navigated to every corner of the state and haven’t struggled with the endearing frustration of re-folding a Rand-McNally in years. I get every baseball broadcast on XM, basketball scores in a Google text, and temper snowboarding expectations with an hourly weather update on an iPhone. A month ago I was in a library and shivered in its obsolete silence. The friend I would ask, “What was the name of that artist who…” is now named Wiki, substituting presumed accuracy for the warmth of follow-up conversation. Little pieces of my digitized soul drift aimlessly online, trapped on social networking profiles I established years ago and have forgotten existed. For every avatar I’ve befriended and every old school chum I’ve recovered, a piece of my memory is auctioned off for cyborg replacement. We can all be reached in an instant. Cell phones in our pockets like Spider-Tracers on our getaway personae. But I can dimly remember when life was very different. 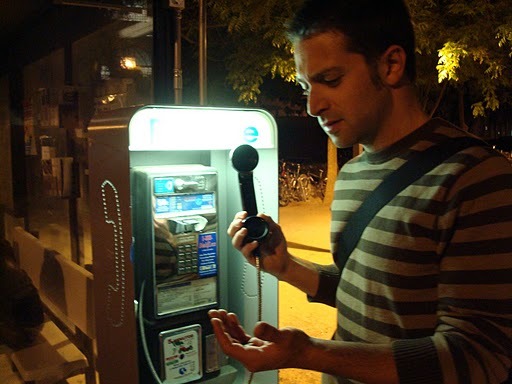 When I knew the location of virtually every payphone on Geary and Clement, and had many of the numbers memorized. Wait on the corner of 8th Avenue outside the Radio Shack; I’ll call you when I get off the bus. Meeting people took on a since-forgotten sense of anticipation — both from the uncertainty of arrival and the true sanctity of personal communication, unaffected by prior emails or cellular status reports. I was in middle school. What the hell did I know about conversation? The school-age me is a distant creature from the students I deal with on a daily basis. I would have embraced this world of mp3s and handheld gaming devices; my mother would have grounded me for spending too much money on texting instead of too much money on comic books. What would I have gained? What would I have lost? Would I be any worse off? I’d undoubtedly feel less scattered… or, at least, I would live in blissful ignorance of my fragmented hard drive. I distinctly remember my grandfather making a big deal out of a payphone rate increase. I must have been in sixth or seventh grade and phone calls home (or to a friend, or the payphone outside the Coronet, or to Best of Two Worlds on a Wednesday in the time before the internet told you in advance which comics were shipping that week and the wait-and-see approach was a scintillating lightning-in-a-bottle buzz of expectation) were going to cost me twenty cents now instead of ten. He filled up my hand with dimes. Always make sure you have dimes, he said.